~Stunning sun disk results reveal the entire coming Northern Hemisphere circulation with ease. spacial cosmic ray setting, ie land and sea affecting the structure done by the gravity exercised by the coldest zone. For the Canada and US it means coldest in the West warmest in the East weather. For the Arctic, the coldest C1 maintains the Arctic ocean current Gyre by sending some of its coldest air feeding the hovering wobbling anticyclone mainly after interactions with cyclones on its east side of C1. The same goes for C2, the second cold air zone gravitas center , in the Barents sea area. The often present anticyclone North of Norway, an artifact of C2, will make NW Europe cooler, all while blocking North Atlantic cyclones from warming and clouding over the Arctic Ocean. 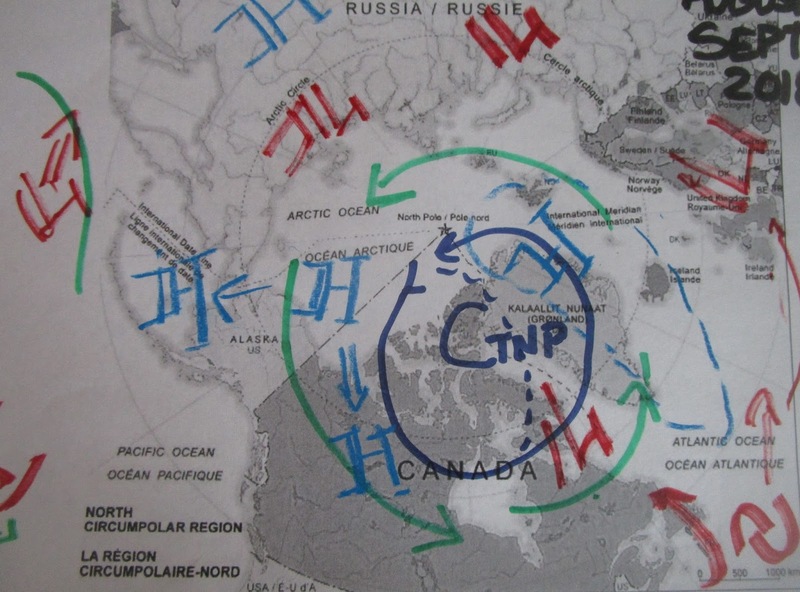 North Pacific area cold air collapse was a long spanning event caused throughout the entire winter, present Bering sea ice scarce and decimated was the imprint of this. C3 was often a meek shadow of Siberian self throughout winter, therefore more cyclonic intrusions for Alaska, which has likely experienced one of their warmest winters in history, not so warm spring. No doubt makes C1 area again the center of cold temperature Gravity , but the planetary system players switch roles. In the Arctic, a summer Low pressure becomes a cold air player , a High pressure a warm one, therefore as with each year summer since 2012 great sea ice melt, 2013 to 2017, gains a lesson learned, cold air lies where cyclones be. They are usually not substantial, I have documented them as "see through" cyclones since they have fewer clouds. 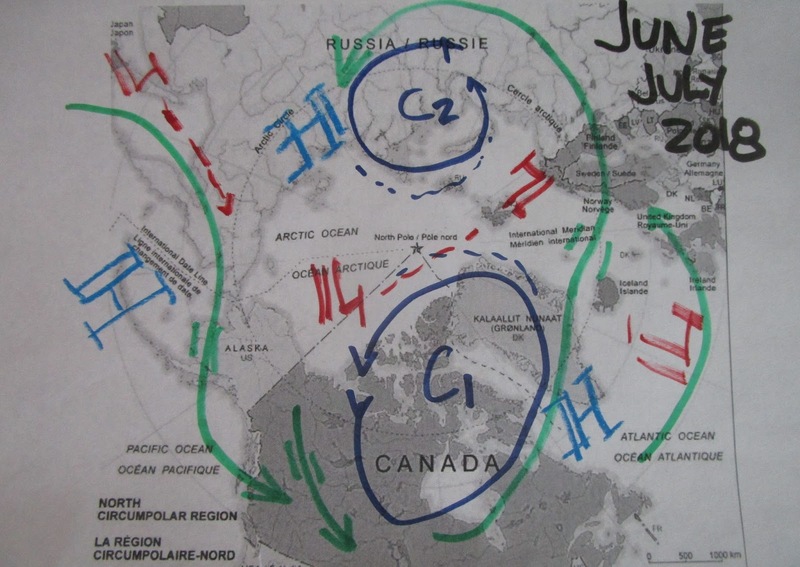 A Low over the Arctic Ocean Gyre area will benefit by C1 cold source though, therefore cold Lows will descend Western Canada, Eastern Canada will gain heat from continental Highs, sometimes called Bermuda Highs when gaining the Atlantic. Lows should strike SW Europe at times, as C2 fades, some North Atlantic cyclones will cool off over the Arctic Ocean, adding to the North Pacific intrusions. 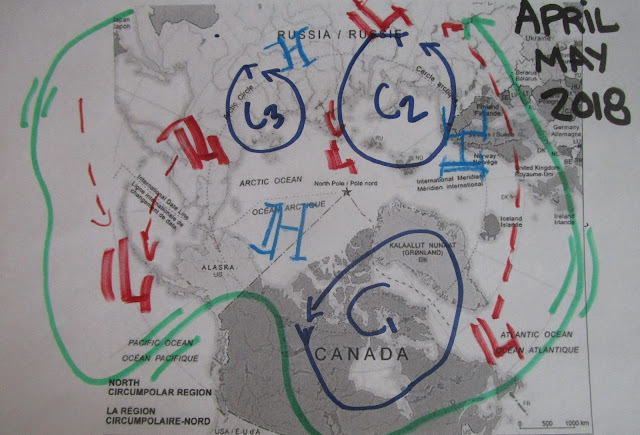 The North Pacific often High pressure zone is the result in part from the steady presence of Arctic Ocean gyre cyclone and also the warmth acquired during the entire winter just past. It is during this June-July period again when the sea ice melts slows, because cold air in Arctic summer is a great cloud saver, they don't evaporate as quick as with anticyclones. Sea ice in the Pacific quadrant of the Pole will be decimated still especially next to Russia. We can see the Polar jet stream in green not being much of a player further South in the US, to the benefit of likely lesser tornadoes.